When looking for apartments near Chicago, the hunt can be overwhelming. But in early 2019, the search becomes much simpler with the arrival of ONE Wheeling Town Center, where your future luxury apartment is complete with countless amenity perks and a prime location, making it an unparalleled place to live. Friends and family who visit your home at ONE Wheeling Town Center may be overcome with apartment envy. The studio, 1 bedroom, and 2 bedroom apartments for lease will be available in two distinct styles—bright Day or dark Night interiors. Whether you’re an early riser or a night owl, your apartment’s colors will be set to match your preferences perfectly. 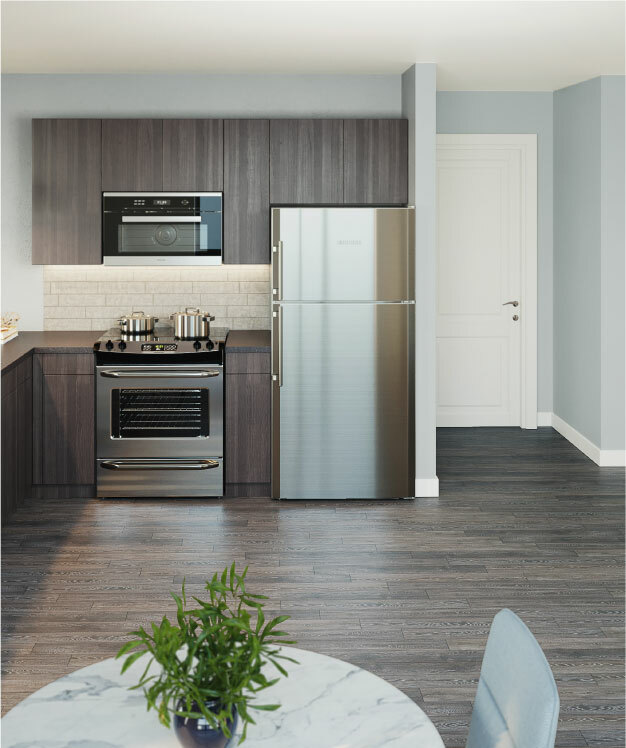 Plus, with brand-new stainless-steel appliances, in-unit washers and dryers, walk-in closets, balconies, and keyless entry, other apartments in Wheeling simply can’t compare! Steps away from the Chicago-bound train, ONE Wheeling Town Center is conveniently located for zipping in and out of the city at any hour. Whether you’re a commuter working downtown or you simply love to explore the city on weekends, getting into Chi-Town could not be easier. Don’t bother with traffic or racing to make the next train—you deserve an apartment near public transportation. Apartments near Wheeling Metra stop are not easy to come by, making ONE Wheeling Town Center a lucky place to call home. Plus, ONE is in the heart of Wheeling Town Center, the highly-anticipated new downtown destination. From your front door, you’ll walk across the pedestrian plaza to grab a coffee at Starbucks, then perhaps stop at 312 Nails & Spa or Inland Bank. For dinner and drinks, Mia’s Cantina or City Works Eatery & Pour House are just a stroll away. Conclude the perfect night with a movie at CMX Luxury Cinema, and then simply take the elevator back up to your apartment! And there’s plenty more to discover in Wheeling. Experience nature and fresh air next door at Heritage Park, or at one of the local golf courses. Imagine you’re a character in Grease or American Graffiti at the old-fashioned Superdawg Drive-In across town, and chow down at Bob Chinn’s famous Crab House, where everyone orders a Mai Tai. With an array of luxury amenities on-site, homebodies and go-getters can all rejoice. Outdoors in the courtyard, enjoy lounging by the heated pool and using the fire pit, BBQ grilling stations, gazebo, and putting green with lawn games like bocce and corn hole. Inside, work up a sweat at the fitness area and yoga studio, then get to work in the business center, conference room, or Wi-Fi equipped common areas. With a private party room, 24-hour doorman service, on-site garage parking, and more, your day-to-day errands and needs will be met right from home. Plus, living green and eco-friendly is part of the lifestyle at ONE Wheeling Town Center. We’re LEED certified and have an Energy Star rating of 75, which means we’re more efficient than 75% of properties nationwide. If you drive an electric car, we’ll have on-site charging stations, too. To learn more about the perks of living at ONE Wheeling Town Center, follow us on Facebook, Twitter, and Instagram for updates on all that’s to come.